A pop-up health clinic in rural Virginia received deliveries of medicine from a drone Friday, the first government-approved drone delivery in the U.S. But the orchestrated event also highlighted the hurdles that remain before such deliveries become everyday occurrences in U.S. skies, as envisioned by Amazon.com Inc. and Google Inc.
A manned aircraft carried the packages most of the way, and the flight plan originally called for the drone to make six round trips to carry a total of 10 pounds. But after two successful deliveries, officials decided to send the rest of the payload in one flight. —Matthew Sweeny, head of drone-delivery startup Flirtey. 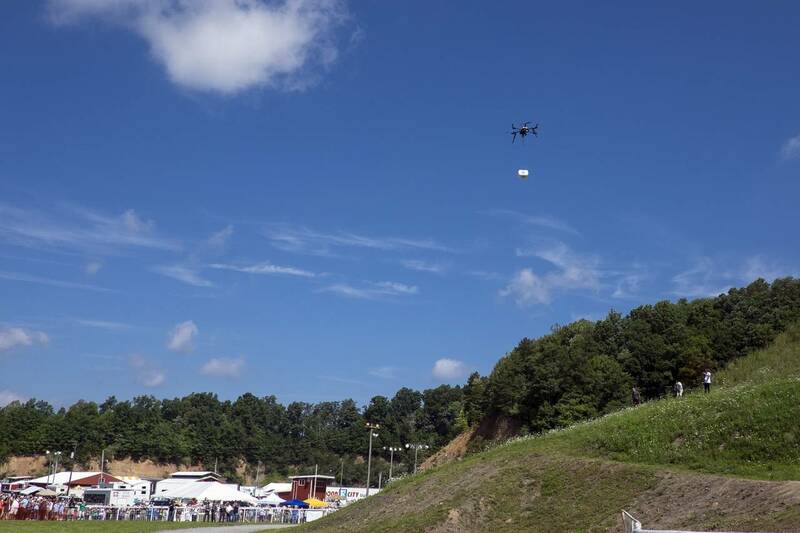 “It was absolutely a Kitty Hawk moment,” Matthew Sweeny, head of the drone-delivery startup Flirtey Inc., which carried out Friday’s deliveries, said in referring to where the Wright Brothers achieved the first successful airplane flight in North Carolina. The drone carried medications prescribed by doctors at the annual Remote Area Clinic, a facility in Wise County, Va., that serves 3,000 patients one weekend a year. Typically, the clinic is limited in which medications it can prescribe, since they are stocked ahead of its opening. The clinic’s supplying pharmacy is in Oakwood, Va., about 35 miles away as the crow flies, or roughly 90 minutes by car over winding roads. Teresa Gardner, director of the pop-up clinic, said the drone was helping to get medicine to patients who often have to wait for days for their prescriptions, if they receive them at all, because of the long drive. “There are at least 30-something patients that will directly benefit from these deliveries,” she said. A larger aircraft first ferried the medication on a 20-minute flight from Oakwood to Lonesome Pines Airport in Wise County. That aircraft, the Cirrus SR-22, is an experimental craft owned by the National Aeronautics and Space Administration and designed to function like a drone in tests. On Friday, a pilot helped the SR-22 take off and land, but it was largely piloted from the ground. In Wise County, Flirtey’s drone took the medicine the final mile from the airport to the clinic, about a three-minute trip on the drone, not counting the time it took to load and unload the device. Most commercial drones can’t yet fly the entire 35-mile trip. Mr. Sweeny said his company’s drones can carry 5.5 pounds as far as 20 miles before their batteries die. Delivery drones also generally lack Federal Aviation Administration permission. The FAA gave Flirtey, NASA and Virginia Tech special approval for Friday’s demonstration, but it effectively bans drone deliveries. The FAA’s proposed drone rules, expected to be made final next year, prohibit flights over people, in cities and beyond sight of the drone’s operator. The rules would also prohibit drones from carrying objects. Several companies, including Google and Deutsche Post DHL AG, have tested drone deliveries outside the U.S. But the first authorized U.S. delivery could help change perceptions of drones as either playthings or weapons systems. “What we’re trying to do is not only develop the technology, but [develop] the public’s trust in the technology,” said Frank Jones, deputy director of NASA Langley’s Research Services Directorate. 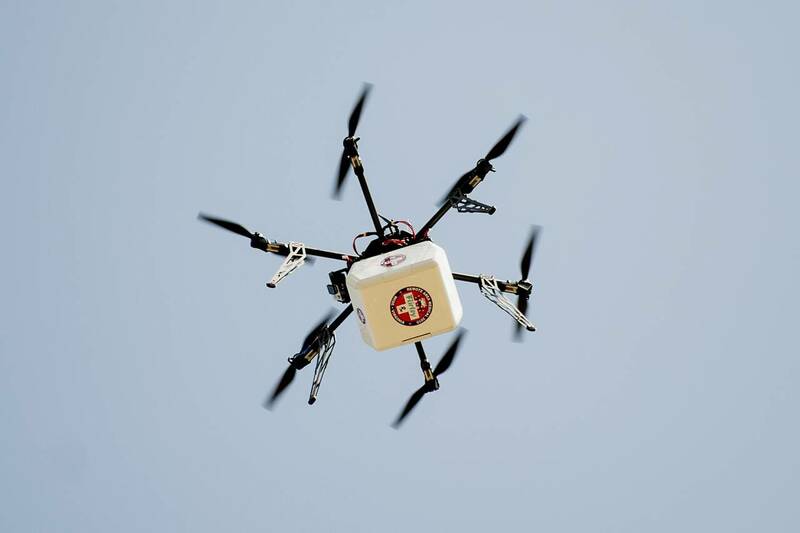 Delivering medical supplies in a rural area is the scenario many industry observers say is most likely for drone manufacturers to pursue in the near term because the need is high and the risk is low, said Colin Snow, an independent analyst who tracks the drone industry. Mr. Sweeny rejected criticisms that the deliveries don’t mark a watershed moment. “Isn’t that like saying the moon landing wasn’t significant because we didn’t have the technology to get to Mars?” he said.